I work in Marketing, but I must confess that my true love is food. So, I decided to start writing about restaurants in Paphos. The idea came to me last night when I was told by a family member who's visiting from Miami, that she tried to search on-line for restaurant reviews, but was unable to find anything. Knowing what people are saying about a restaurant is important to ensure that you get what you are looking for. I don't eat out very often in Cyprus because of my twenty-month-old son and pregnant wife, but I will try to share my observations. In the US I was a restaurant owner for over 13 years and also worked for the largest food distributor as a marketing associate. Here is my first review - please give us your opinions about the places I write about or experiences you have had at restuarants while Living in Cyprus. Last night we decided on a pizza place that we had been to once last year and is very popular in Paphos. The restaurant is called La Sardegna and is owned by an Italian. 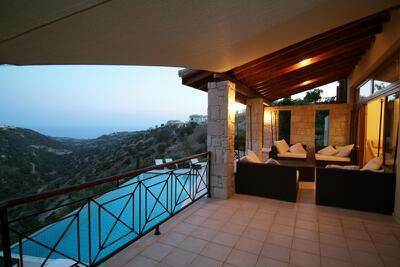 It is located on the main road going down to Kato Paphos. Our experience didn't start too well. We made reservations, but when we arrived the staff was particularly disorganized and harassed. I would be harassed though too if I had to work on such a humid night. Despite having our names wrong there was a table for 8 as requested. The place was packed and our drinks arrived fairly quickly. We started with appetizers of Prawns in a delicious, light garlic, cheese and tomato sauce and Bruschetta that was absolutely delicious - even better than anything I had in the US. It took over 45 minutes to get our appetizers but it was well worth it. Soon afterwards our main course arrived. We ordered a ham and cream pizza that doesn't look so appetizing but tastes wonderful. Also, the Spaghetti Bolognese looked bland and I almost didn't taste it because of the look of it, but again I was proved wrong. All in all, the food is well worth it, though not cheap. I would say for Cyprus it is in the moderate price range with our food costing approximatly 11CYP per person including beers, wine, sodas and several of each item: 3 mushrooms, 3 prawns, 2 pizzas etc. I have mentioned the more positive aspect which is the delicious food. However, to touch briefly on the negative side it was very, very hot and humid and there are no fans or air conditioning, the staff is so busy you do not get any personalized attention or very good service for that matter, it is NOT child friendly at all - no high chairs, boosters, crayons or anything that would entertain a small child. It is also NOT handicap accessible, the tables are crowded together and the location is not the greatest. Overall, presentation and service is not a high priority, but the taste of the food will bring you back to La Sardegna again and again. Just don't go if you can't take the heat of the summer, have a small child, want a romantic meal or like your personal space. If those things turn you off, but still want some delicious food, then definitely order take out! Whether you are planning to buy your first Aphrodite Hills property or sell your existing home, contact us today!